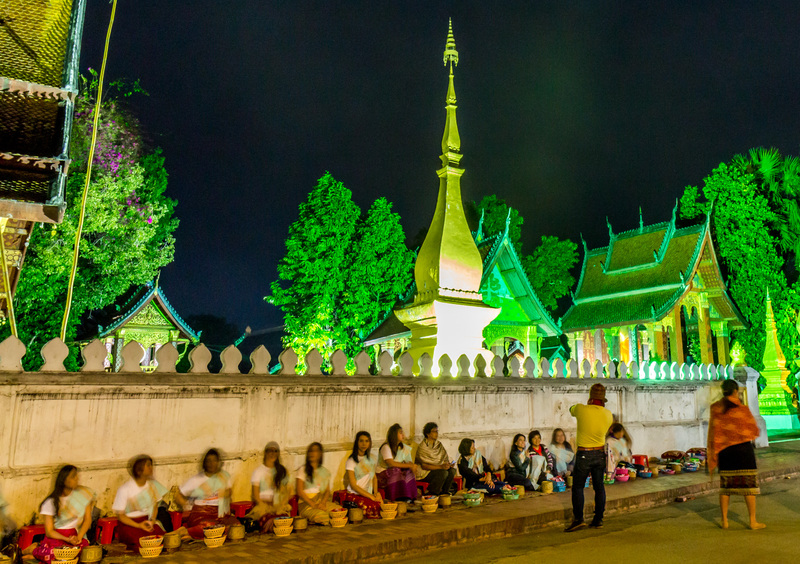 Luang Prabang has become famous for its traditional alms ceremony. 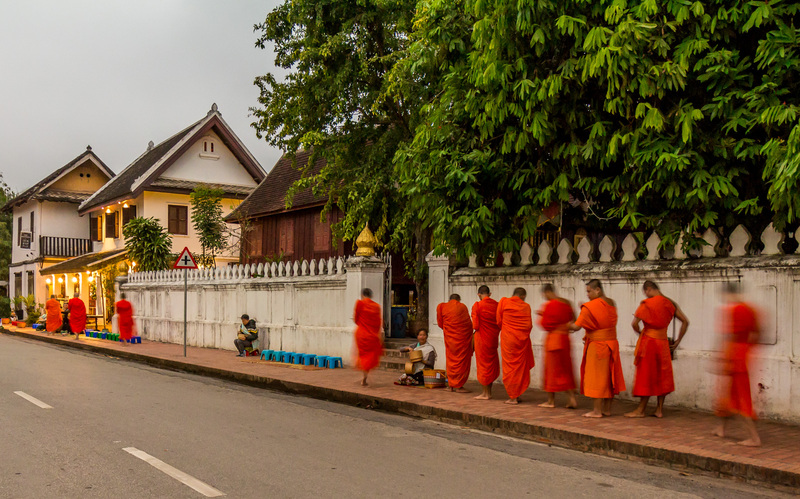 The city has many monasteries, and before dawn every morning the monks walk around the block, collecting donations of food from kneeling local people dressed in traditional sarongs. Needless to say, it is spectacularly phonographic. I too woke up before dawn, and made my way to the main monastery in the old town, which was lit up in eerie green lights. Crowds of Chinese and Western tourists were already gathering, and they outnumbered the locals. 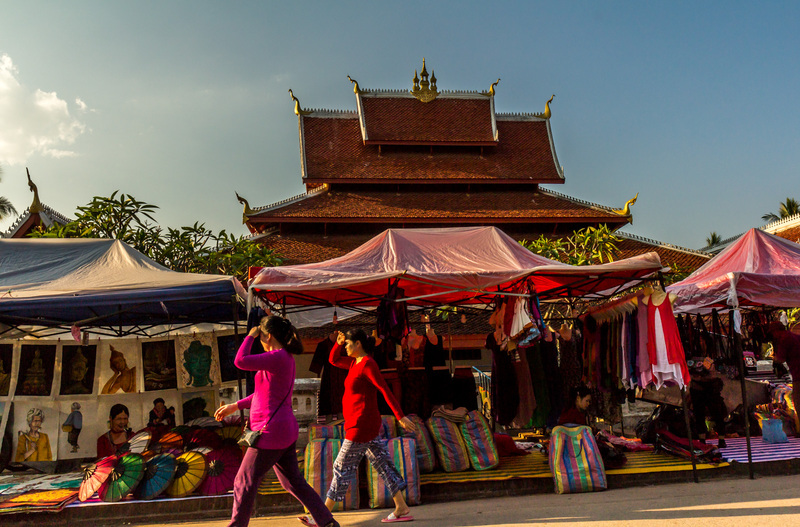 Ladies had tables set up in the middle of street full of packaged junk food that they were selling to tourists to give to the monks. 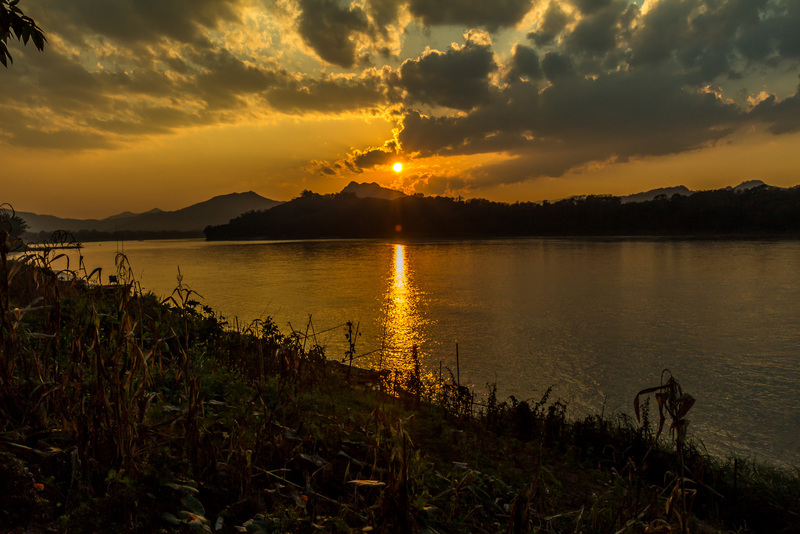 The sky got light and a drum sounded from the monastery. 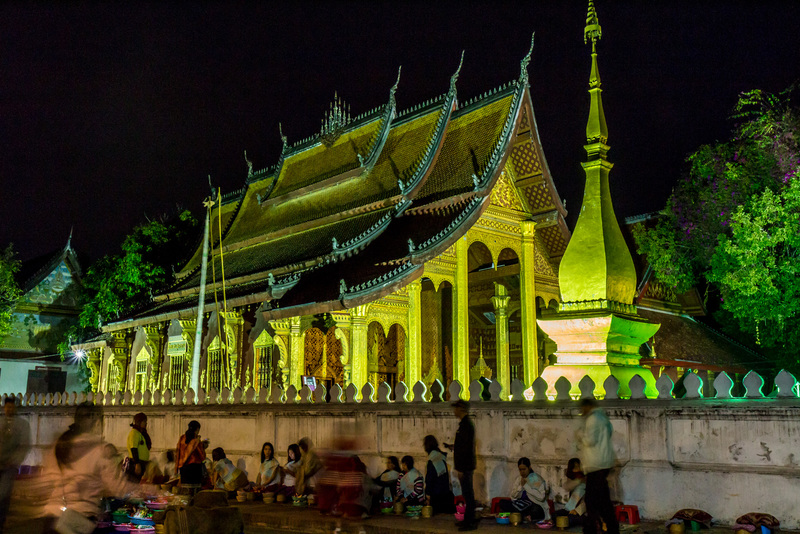 A small group of neon orange robed barefoot monks quickly made their way out of their temple, stopping briefly at the small group of Lao women respectfully sitting on low stools. 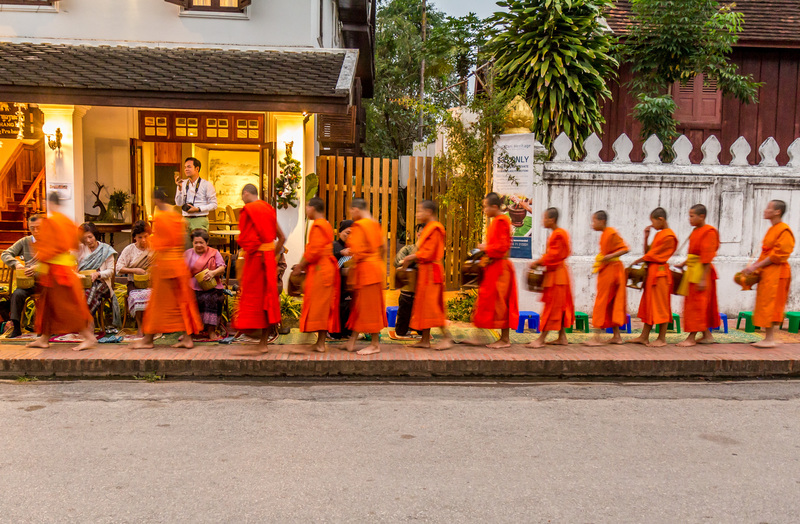 The mobs of tourists immediately pounced, surrounding the monks and snapping pictures right in their faces. It was a disheartening experience. 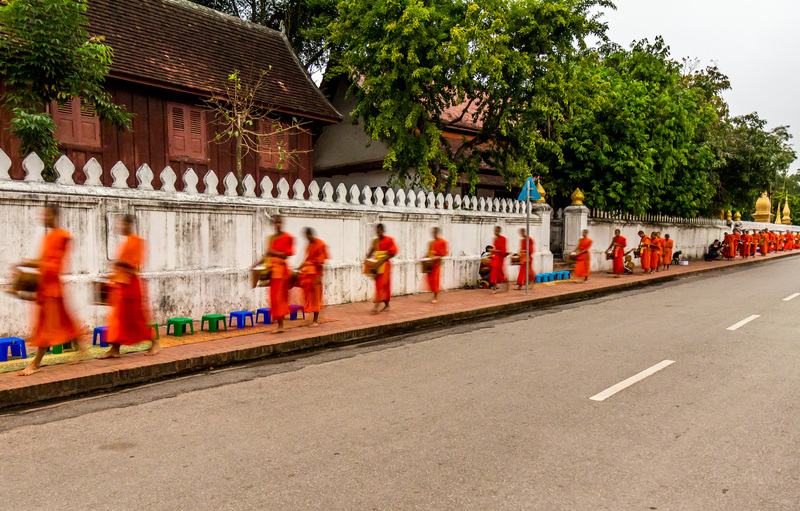 The monks did their best to get away from the rabid tourists as fast as possible, and practically ran around the block. It’s a shame that tourists have ruined something so special. 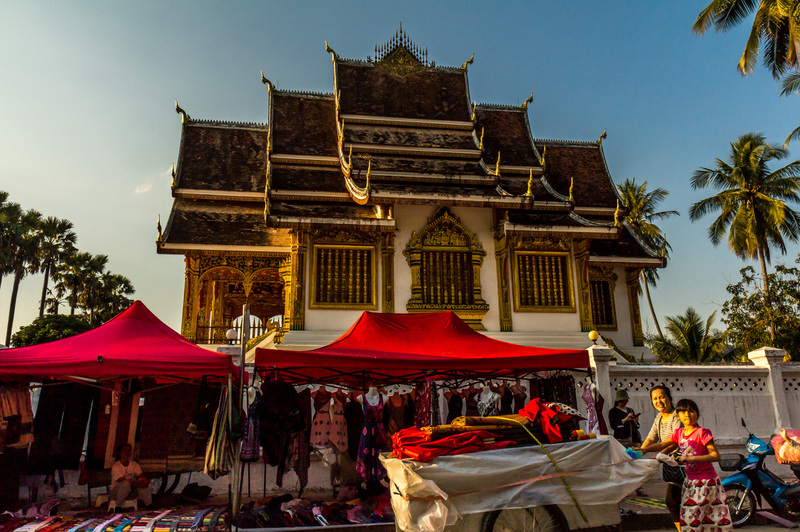 Luang Prabong is still the top place to visit if you’re going to Laos. The city has many wonders to behold. Just don’t expect much out of the alms ceremony. 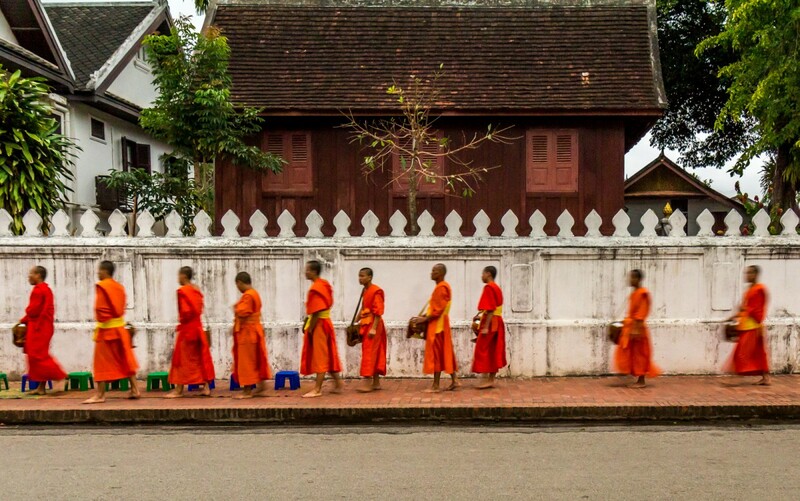 The monks made their appearance. But not many giving alms. 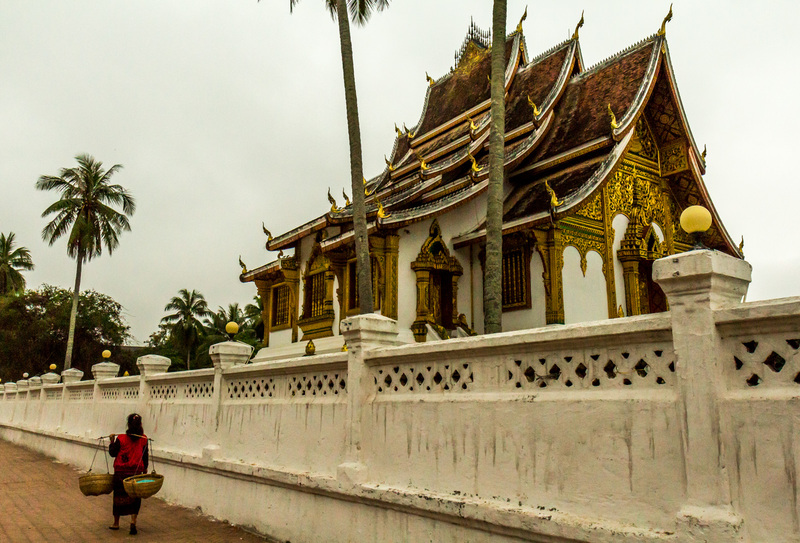 A vendor passes the palace. 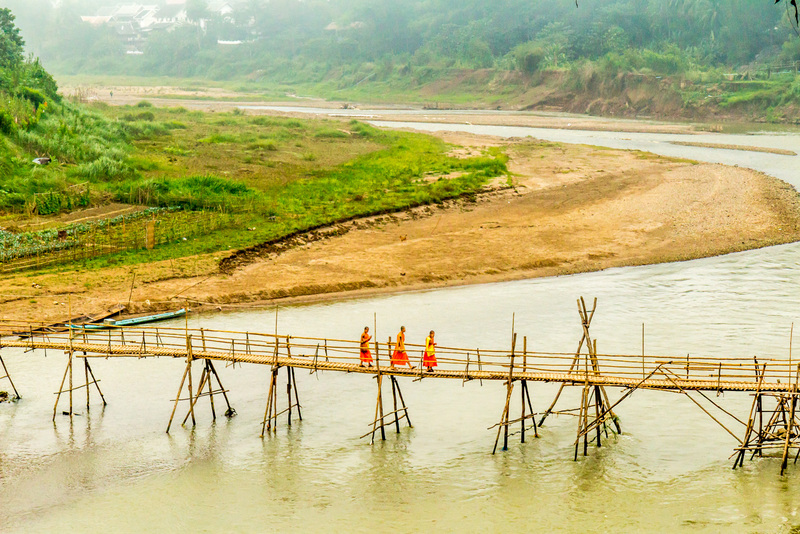 Monks crossing the bamboo bridge. 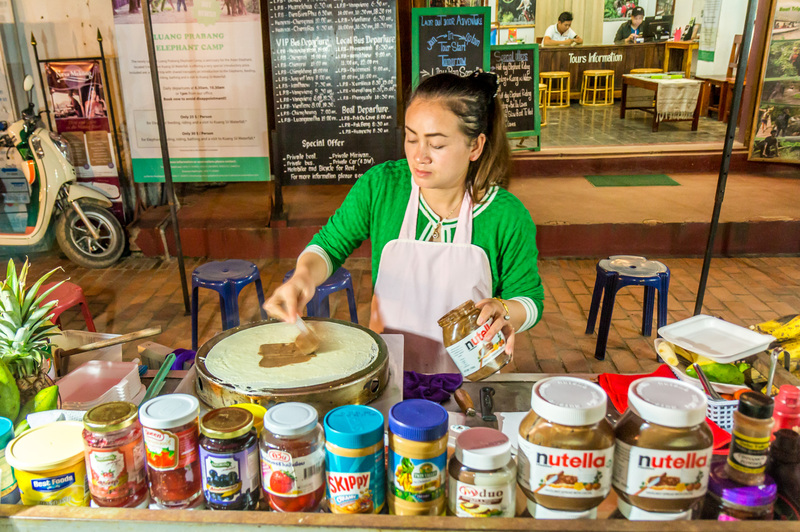 Strolling past the night market. 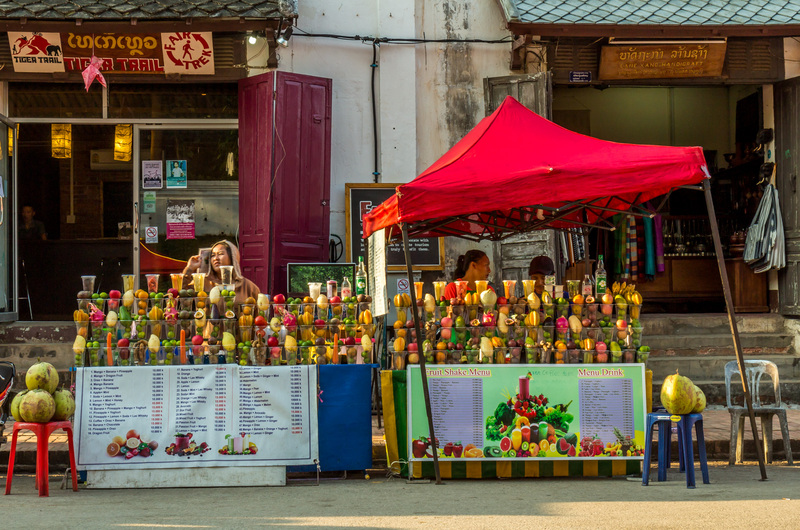 Setting up the night market. Fruit shake ladies at the ready. 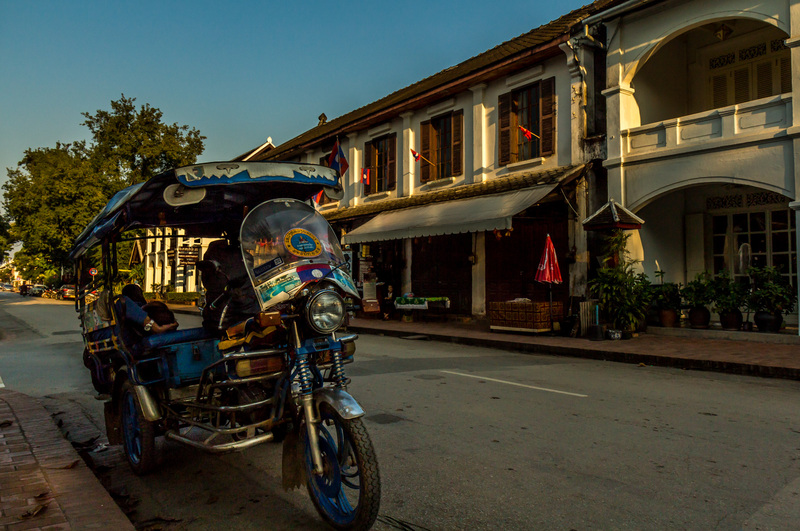 A tuk tuk in the old town. 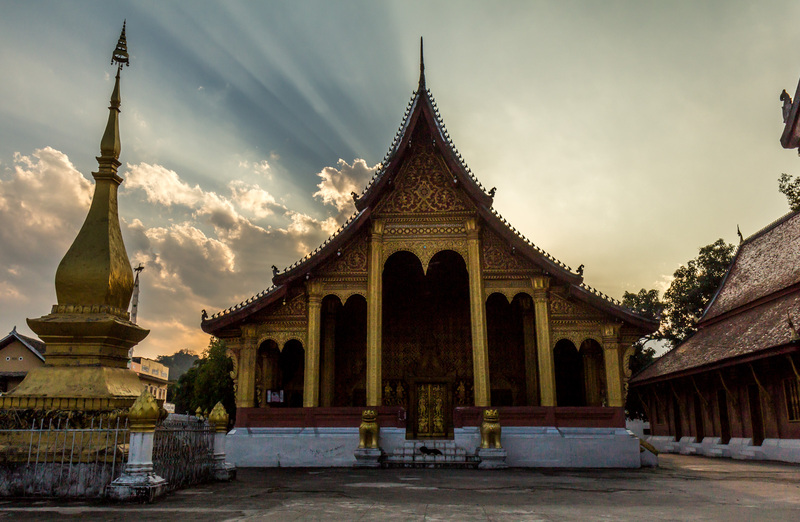 One of Luang Prabang’s many temples.